No one realized the level of heart and tenacity this team possessed, the pluck and verve this team could summon in the face of adversity. The Reds came from behind to win 45 games, and whenever they took a tough loss, they bounced back the next game. They truly were The Comeback Kids." As baseball fans throughout the country waited for them slide back to expectations, they just kept hustling and winning. There are memorable teams in baseball--and then there are utterly unforgettable teams like the 1975 Cincinnati Reds. From 1972 to 1976, the franchise known as the Big Red Machine dominated the National League, winning four division crowns, three league pennants, and two World Series titles. But their 1975 season has become the stuff of sports legend. In The Machine, award-winning sports columnist Joe Posnanski captures all of the passion and tension, drama and glory of this extraordinary team considered to be one of the greatest ever to take the field. Helmed by Hall of Fame manager Sparky Anderson, the lineup for the '75 Reds is a Who's Who of baseball stars: Pete Rose, Ken Griffey, Joe Morgan, Johnny Bench, Tony Perez, George Foster, Cesar Geronimo, and Dave Concepcion. Like a well-oiled engine, the '75 Reds ended the regular season with 108 wins and finished a whopping 20 games ahead of their closest division competitor, the Los Angeles Dodgers. But that remarkable year was not without controversy. Feuds, fights, insults, and run-ins with fans were as much a part of the season as hits, runs, steals, and strikeouts. Capturing this rollicking thrill-ride of a story, Posnanski brings to vivid life the excitement, hope, and high expectations that surrounded the players from the beginning of spring training through the long summer and into a nail-biting World Series, where, in the ninth inning of the seventh game, the Big Red Machine fulfilled its destiny, defeating the Boston Red Sox 4-3. As enthralling and entertaining as the season and players it captures, The Machine is the story of a team unlike any other in the sport's glorious history. Are you ready for the real story of the Cincinnati Reds? As one of baseball's oldest and most successful franchises, the Reds have a long history of legends and goats, great comebacks and colossal failures, World Series championships and heartbreaking losses. The Good, the Bad, and the Ugly: Cincinnati Reds is a must for every fan who wants an unflinching look at the greatest--and worst--players, coaches, and moments in Reds history! The Big Red Machine dominated major league baseball in the 1970s, but the Cincinnati franchise began its climb to that pinnacle in 1961, when an unlikely collection of cast-offs and wannabes stunned the baseball world by winning the National League pennant. Led by revered manager Fred Hutchinson, the team featured rising stars like Frank Robinson, Jim O'Toole, and Vada Pinson, fading stars like Gus Bell and Wally Post, and a few castoffs who suddenly came into their own, like Gene Freese and 20-game-winner Joey Jay. In time to celebrate the 50th anniversary of their pennant-winning season, the amazing story of the Ragamuffin Reds" is told from start to finish in Before the Machine. 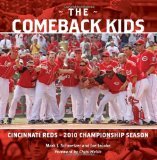 Written by long-time Reds Report editor Mark J. Schmetzer and featuring dozens of photos by award-winning photographer Jerry Klumpe of the Cincinnati Post & Times Star, this book surely will be a winner with every fan in Reds country and coincides with an anniversary exhibit at the Cincinnati Reds Hall of Fame and Museum. Through interviews and research, Before the Machine captures the excitement of a pennant race for a team that had suffered losing seasons in 14 of the past 16 years. Schmetzer also beautifully evokes the time and place a muggy Midwestern summer during which, as the new song of the season boasts, the whole town's batty for that team in Cincinnati." Led by regional talk-show star Ruth Lyons (the Midwest's Oprah") fans rallied around the Reds as never before. The year didn't begin well for the team. Budding superstar Frank Robinson was arrested right before spring training for carrying a concealed weapon, and long-time owner Powel Crosley Jr., died suddenly just days before the start of the season. Few experts or fans gave the Reds much of a chance at first place anyway. With powerhouse teams in Los Angeles, San Francisco, and Milwaukee, the National League pennant was unlikely to fly over Cincinnati's Crosley Field. But manager Hutchinson somehow galvanized his motley crew and led them to victory after victory. Joey Jay, who had languished with the Braves, mowed down hitters while his rotation mates O'Toole and knuckleballer Bob Purkey did the same. The team also featured a dynamic duo in the bullpen in Bill Henry and Jim Brosnan, whose book about the season, Pennant Race, became a national bestseller the following year. As the rest of the league kept waiting for the Reds to fade, Hutch's boys kept winning and finally grabbed the pennant. Though they couldn't continue their magic in the World Series against the Yankees, the previously moribund Reds franchise did continue to their success throughout the decade, winning 98 games in 1962 and falling just short of another pennant in 1964. They established a recipe for success that would lead, a few years later, to the emergence of the Big Red Machine. They were a one-year wonder, but what a year. The 1990 Cincinnati Reds stunned the baseball world by winning the National League pennant and then sweeping the heavily favored Oakland A's in the World Series. The Reds held first place from game one through the end of the world championships becoming one of only three wire-to-wire champions in major league history. Surprisingly, the story of this colorful team has never been told before in a book. 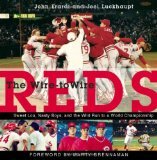 In conjunction with the 20th anniversary of this historic achievement, The Wire-to-Wire Reds brings back the memories with original interviews, more than one hundred photos, and riveting storytelling by award-winning Cincinnati Enquirer columnist John Erardi and blog-master Joel Luckhaupt. With a foreword by Hall of Fame Reds announcer Marty Brennaman, The Wire-to-Wire Reds is the ultimate keepsake for fans throughout Reds Country. The Cincinnati Reds, founding fathers of professional baseball, have no historical equal. The team has a history rich in players, personalities, and championship moments. Echoes of Cincinnati Reds Baseball chronicles that history through some of the greatest sportswriting of the past century and a half. From the original Red Stockings to Johnny Vander Meer, and from the Big Red Machine to Junior, this book covers all the bases that define Cincinnati Reds baseball. Fred Hutchinson is memorialized today by the Hutch Award given annually by Major League Baseball and the Fred Hutchinson Cancer Research Center in Seattle, one of the top research centers in the world. The popular manager of the Cincinnati Reds was at the top of his profession when he was suddenly diagnosed with terminal lung cancer in December 1963. This is the story of Fred Hutchinson and his players (including Frank Robinson, a young Pete Rose, Joe Nuxhall and Tony Perez) as they completed his inspirational final season. In 1964, the Reds battled themselves, their opponents and their emotions to mount a late winning streak which, coupled with the historic collapse of the Phillies, allowed the team to enter the final day with a chance to win the pennant for their stricken manager. The era of free agency in Major League Baseball ensured that it would be difficult to keep star teams together year after year. The 1976 Cincinnati Reds were one of the last to be considered a "dynasty", and this book documents the season of one of the greatest teams in baseball history. During the pursuit of a second-straight world championship in 1976, the "Big Red Machine" was fueled by all-time hits leader Pete Rose, slugger George Foster, and all-stars Johnny Bench and Joe Morgan, as well as a balanced pitching staff that had seven players notching double-digit win totals. The 102-win regular season ended with World Series sweep of the New York Yankees. As part of every Reds game broadcast on the Reds Radio Network, Greg Rhodes, noted baseball historian and director of the Reds Hall of Fame and Museum, presents a brief, colorful account of a memorable moment in the history of America's longest-running baseball team. These pieces have become a favorite feature for Reds fans, who love to celebrate the Big Red Machine's long and storied history and traditions. This collection brings together every single one of Rhodes' pieces in a single book for both Reds fans and baseball aficionados. Cincinnati Reds Hall of Fame Highlights chronicles more than 130 years of history and five world series championships and includes over 300 short accounts of the team's greatest, saddest, wildest, and weirdest players and moments. Packed with over 100 photos furnished by the Reds and their museum, the book pays tribute to a team that remains one of America's favorites. First published in 1948, Lee Allen's history of the Reds, like Franklin Lewis's history of the Cleveland Indians, was originally published by G. P. Putnam's Sons. Allen narrates the historic organization's success, beginning shortly after the Civil War with baseball's rising popularity among Cincinnati's elite. Eventually, as interest increased, America's first professional baseball team was established in 1868--Cincinnati's Red Stockings. The Cincinnati Reds chronicles each season from the organization's early years, most notably the 1882 American Association pennant and the 1919 and 1940 National League pennants and World Series championships, including the infamous Chicago White Sox scandal. Allen retells many of the early Reds stories likely forgotten or unknown by today's fans. This book is as thorough as it is absorbing and will be enjoyed by those interested in the early days of America's favorite past-time.